Make use of your data leftovers before the promo expires with Globe EXTEND service. For only 5 pesos you can add up another day extension to continue your surfing habit. Once your promo is extended you can start browsing right after it expires including free Facebook and free Viber bundled on your GoSURF promo. 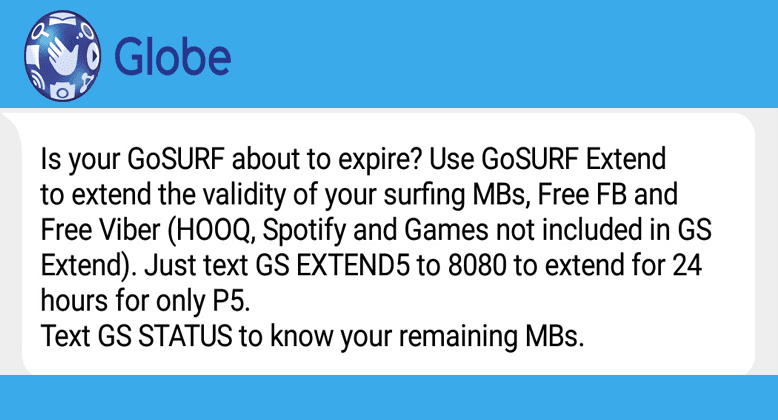 As long as you have MB’s left on your GoSurf promo you EXTEND it for another day. You must have enough remaining MB to benefit this service to enjoy added 24 hours surfing. 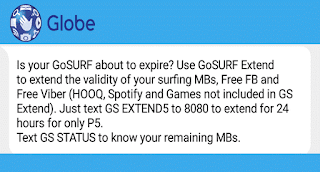 Let’s say you haven’t use your Globe GoSURF50 promo and you have 500MB left after 3 busy days, with EXTEND you can continue using the same promo to fully consume the 500MB left for only 5 pesos. Before you extend your promo make sure to know the remaining MB’’s left by texting GS STATUS. You will receive an SMS text with details of your GoSURF. Make sure to avail register before your promo expires. This is not the same concept with TM EXTEND where you can extend a promo up 365x times, with Globe you only use the remaining MB’s of your current promo and consume it for another day. Be informed also that HOOQ, Spotify and other GAMES are not covered when you use this service. Call and text promos are not yet available for EXTEND, this is only intended for GoSURF Promos.